Click here to Pre-Order Your Spring/Summer Vol 3. North & Peach Magazine NOW! ORDER NOW!!! 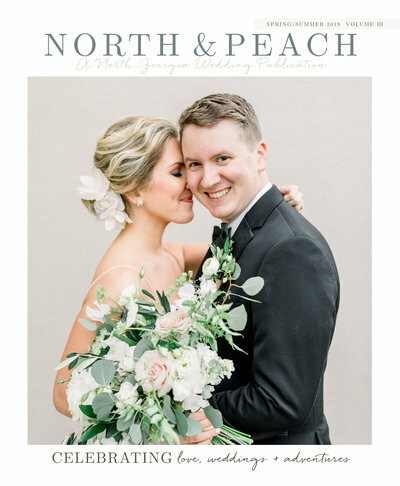 The 2019 Vol 3 issue of North & Peach Wedding Magazine is an essential planning tool and inspiration for local and destination wedding couples planning their weddings in North Georgia. This issue features over 150 pages jam-packed with North Georgia wedding inspiration. Get inspired by the latest trends in design, decor, fashion, and everything in-between, all provided by real wedding pros from your area! Get connected with the best wedding vendors in North Georgia. You’ll find hundreds of pages showcasing real, swoon-worthy weddings that will have you more excited than ever for your own special day! Digital issue gets sent straight to your inbox the second this Magazine goes LIVE the beginning of April. Print issue to follow and land straight onto your door step after the first week of April.